I’ve found an interesting new internet presence. Trigger Warning is a California LLC that was started in 2015 by Rachel Haywire of INSTED. It is a new media entity that houses a unique network of writers, artists, journalists, and cultural innovators; offering a provocative alternative to the liberal paradigm of our current media narrative. It is a platform for controversial and thought-provoking material, expanding into the physical space for private parties and intellectual salons. Bruce Sterling, one of the first cyberpunk authors to receive mainstream attention, is no stranger to radical tech. 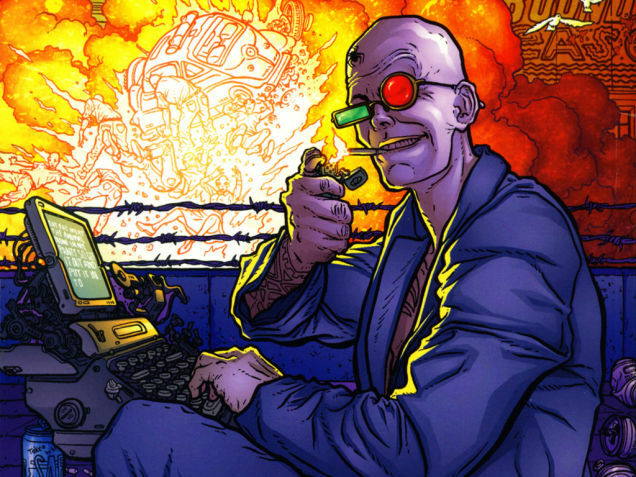 With titles ranging from The Hacker Crackdown to The Difference Engine to Schismatrix to Distraction, his pertinent social commentary and visionary ideas have remained influential to this day. His critically acclaimed work has won several Hugo Awards. When I saw that he was following us on Twitter, I knew that I had to ask him for an interview. Rachel Haywire: Throughout your various writings, you have made some predictions that have turned out to be true, both on the Internet and in the flesh. Do you think you are able to foresee the future, or do you have more of a knack for predicting trends based on present experiences? Maybe a combination of both? Bruce Sterling: It’s simpler than that. There is no absolute “future.” There isn’t any boss in charge with a stopwatch who can keep accurate track of the so-called future and the so-called past. If I’m already sick of Facebook, and I “predict” to you that “some day you’ll get sick of Facebook,” and later you do get sick of Facebook, then I have told you your “future.” That is it. If you didn’t know about it now, and it hits you later, then that is your “future.” When you finally catch on, that’s when I become the futurist who predicted that you would get sick of Facebook. 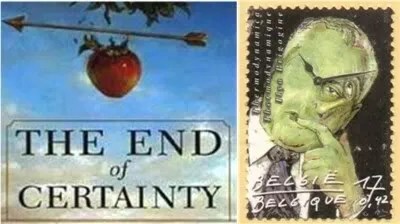 Ilya Prigogine book The End of Certainty and a postage stamp in his honor. I recently finished reading Bruce Sterling’s Schismatrix Plus. This is a novel that starts out pretty good, gets better, coasts briefly, then gets better and better and then, unexpectedly, oustandingly better still! It peeks profoundly and ties up loose ends satisfyingly. Here’s a example of smart writing: Descendants of the human race have branched into many factions, or races, including the Shapers, the Mechanists, and the SuperBrights. The reader gradually acquires knowledge about each faction as Sterling describes their appearance, actions, and thought processes. As the book progressed, I felt like I understood the origin and nature of each faction, but what really made me smile was, near the end, one of the book’s characters gives a straightforward history of each of those three factions. This is much more effective than telling it all at the beginning. As the reader, I got a satisfying feeling of affirmation that things were, indeed, as I thought. That’s the smart part. “In this essay I briefly sketch the shape of the new paradigm of deterministic chaos and self-organizing systems as it has been developed by Ilya Prigogine. I will trace its emergence as a theme in SF, particularly in works by A.A. Attanasio, Lewis Shiner, Bruce Sterling, and William Gibson. Along the way I show how Chaos Theory illuminates the potential for narrative, and particularly SF, as epistemologically potent. “Evolution and entropy seem to contradict each other not only in the cosmological moods they invite us to hold, but in the irreconcilable versions they present of how the universal machine actually operates. If Rudolf Clausius and Clerk Maxwell were right, then any machine will grind to a halt inexorably when left to its own devices. The combination of ever-present forces—like friction—will degrade mechanical operation as part wears against part, leaking valuable energy and organization out into the universal soup where it joins the larger tide towards randomness and absolute cold. Furthermore, once molecules have vibrated themselves into an effete state of equilibrium—analogous to hot and cold water mixing into one lukewarm volume—no natural force can retrieve that leaked heat or lost differentiation. The process of degradation towards entropy is irreversible: nature will not reheat the water again.